Butternut squash is one of those ingredients that I'm learning to love. I've never liked squash in general (as I've mentioned a thousand times on this blog), but since I get them from my CSA, I have always felt an obligation to keep trying the different squashes so I don't waste what we're given. Last year, I came up with a soup that my husband and I love and then I froze the rest to be used in quick breads in lieu of pumpkin. Last week we received our first butternut squash, and I struggled to suppress a groan. I know, I know, I'm crazy, but I just haven't been feeling creative in the kitchen over the past couple of weeks. The slump is due to my crazy busy life, I know, but just thinking about figuring out what to do with the squash was exhausting. Then inspiration struck...I was going to make some risotto! 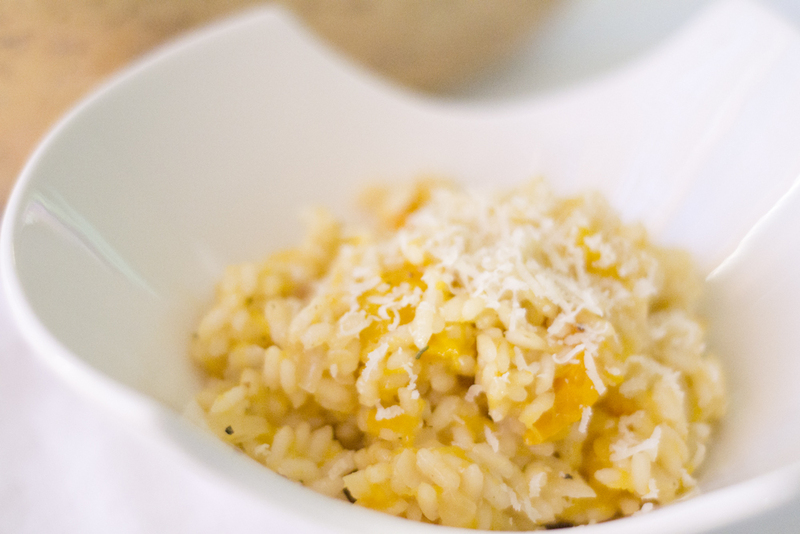 I have about ten different rices in my cupboard, and had just been thinking about how to get them into my repertoire more often when the butternut squash crisis happened. And that's how a delicious recipe and side dish was born out of the ashes of my worn-down self. Make it...you won't be disappointed! Preheat the oven to 400 degrees F. Lay the butternut squash wedges in a rimmed baking sheet, skin side down. Sprinkle the flesh with the sage, salt and pepper. Drizzle a little olive oil over the squash, and using a pastry brush, brush the oil all over the flesh so that it's completely coated. Place in the oven and bake for 30-50 minutes or until the flesh is soft. When the squash is cooked, remove from the oven and allow to cool slightly. Scoop out the flesh into a bowl and smash with the back of a fork until it is broken down. There should be some chunks left. Set aside. Heat the chicken stock in a saucepan until just simmering. In a larger pot, heat the butter and oil over medium heat until the butter is melted. Add the onions and saute until the onions start to wilt, about 5-10 minutes. Add the rice and sage and stir to coat with oil. Saute, stirring often, for a couple of minutes, or until the rice starts to become translucent. Add the wine, stirring constantly until the wine is almost completely absorbed. Add 1/2 cup chicken stock and stir until it's almost completely absorbed. Continue adding chicken stock, 1/2 cup at a time, until the stock is used up or until your rice is done. (Risotto should be done "al dente," which means that there should be some chewiness to the rice. It should not get mushy.) If you use up all of the stock and the rice is not completely done, add a little hot water until it is done. 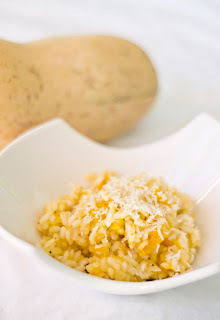 Add the butternut squash "puree" and parmesan cheese to the rice. Stir well and taste. Add salt and pepper to taste. Serve hot with a sprinkling of parmesan. Great minds think alike (again), I just bookmarked a similar recipe! Yum! Many people buy high-quality copies of the replica watches spirit than a century found themselves more satisfied with their acquisition and are very pleased to show off that they have that opportunity. The fact is that most watches replica feels real movie stars in their wrists, perfect imitation. This is a real story about a watch can change a person's life, even though it may not be a lifetime cost savings. Anyone can get high-quality reproductions, most suited to their personality and get less than a quarter of the original price of luxury expensive look. Once you find the http://www.bisglobal.co.uk right retailers, all you need to do is choose your model. In addition, most of the copies of "want to buy more than just a replica of a variety of high quality products for daily use, bought some special occasions, holidays, boys night, etc. Why not a little crazy ? it's not like you to spend the money for omega replica house because you do not buy the real deal, but only the best thing in the future! Take a look at the effectiveness of a travelling bag by way of pushing a shoulder straps and after that study a zips and the clothing plus fabric. replica dior bags Study a travelling bag out of different factors to measure every loose line when while you pay for low-priced baggage, the chance winning monetary value is definitely very low. replica hublot Looking for the best affordable handbags might be a time consuming project primarily if you find yourself wanting to not spend as much. chanel replica sale Having said that, you cannot assume all sellers sell off baggage along at the exact amount and as such them results in being critical so you might shell out plenty of time against your find level of quality baggage during economical fee. gucci replica sale However, amount can help determine toughness, nonetheless in most cases low-priced products and solutions might pass one’s goals. cartier replica sale We're a home based business govt during Excellent Extras Inc., When We certainly have cool and trendy extras and incredibly very similar affordable handbags plus rings treasured by way of super stars plus brought to life by the best treasured graphic designers plus companies.